Syracuse, N.Y. – Promotions and events bring different fans to NBT Bank Stadium each game. Stability and familiarity is what brings John Wesche back each game. It was a big day at NBT bank stadium. The 11-1 score line between the Chiefs and the Louisville Bats, Boeheim’s Army stood tall on the mound, and the lines for dollar hotdogs stretched as far as the eye could see. Red and green was scattered through the stadium celebrating Christmas in July. These different promotions aimed to bring the people of Syracuse in, and they were successful. Seats were filled with thriving fans consuming multiple dollar hot dogs and cheap beer. Entertainment and excitement was the theme of the afternoon. However, something remained consistent for the dozen home games the Chiefs will play this year. Among the crowd near first base sat John Wesche ,71, who sat in this stadium opening day in 1997. The stadium’s transition from turf to grass and the increase in beer prices were the only two changes that Wesche noticed in his 20 or so years at the stadium, but the reasons behind attending the games did not. Attending baseball games is family tradition for the Wesches. Baseball is comfortability. Baseball is consistency. Baseball is legacy. Taking statistics at games is a technique Wesche uses to stay focused, but most importantly, it’s a skill that was passed down from his mother. Wesche has passed forward the statistics sheet to his children and wife. Wesche has attended minor and major league baseball games since he was in elementary school and has taken stats at every game without fail. Love is not an emotion Wesche attaches to baseball. The habit of coming to games with loved ones is. Wesche partakes in the simple things baseball has to offer like spending time with his buddies in the stands and enjoying the serenity that midday games bring. Baseball games are a legacy in the Wesche family. 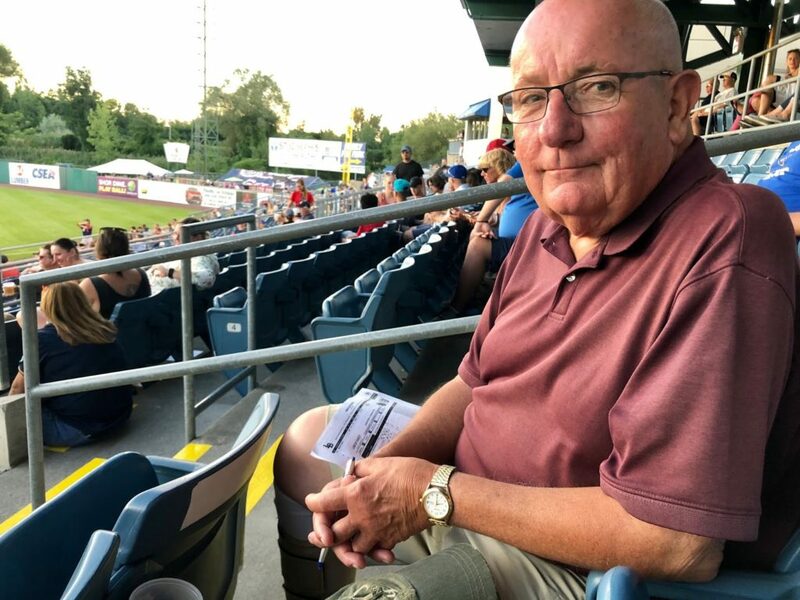 The consistency that they have been bringing to NBT Bank Stadium since opening day has created a legacy of their own in the stands.